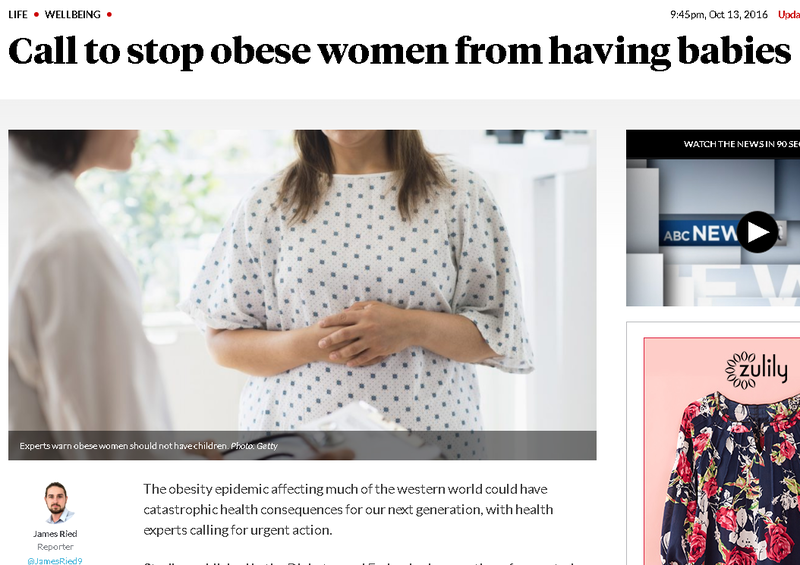 A fairly recent article in an Australian newspaper ─ October 2016 ─ had the inflammatory headline, "Call to stop obese women from having babies." The picture below it featured a woman with a slight double chin and said, "Experts warn obese women should not have children." Well, here we go again with the Obesity Eugenics Wars. This incredibly discriminatory movement is the winner of not one but two Turkey Awards. It's time to call these egregious practices out. If you aren't familiar with them, the Turkey Awards are the "prizes" I hand out to highlight fat-phobic treatment of people of size from care providers, biased attitudes or studies from researchers, or troubling trends in the care of fat pregnant women these days. I haven't done a Turkey Award in quite a while, so I'm doing two years in a row now. To make it easier to read, I'm splitting one giant post up into two. Today's post is about attention to the Obesity Eugenics Media Campaign and its impact on women. In the future, we will highlight the egregious lack of access to fertility treatment for high BMI women and how this plays into Obesity Eugenics. There has been a concerted public health campaign in recent years to vilify fat pregnant women, scare them away from pregnancy via risk hyperbole, and present only negative stories about fat pregnancy in the media. Obese women shouldn't even get pregnant. Why are you crying? It’s not like you lost anything. A woman your size has no business being pregnant anyway. 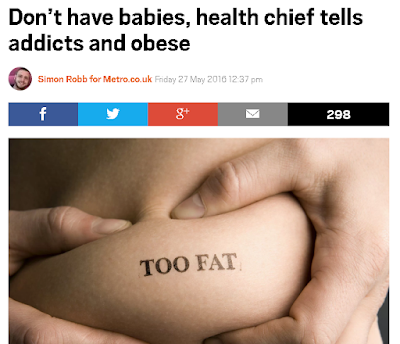 Experts warn obese women should not have children. Although these experts justify their actions by saying it's for the sake of the children to get around criticism, that's baloney. This is nothing more than weight bias, pure and simple, combined with the arrogant belief that doctors should be the gatekeepers to who is allowed to reproduce. And that is completely unacceptable. There have been a series of media articles in recent years designed to discourage obese women from having children unless they reach a "normal" BMI first. These articles have hardly been objective. They use scary headlines, cite worst-case scenarios, use emotionally manipulative language, and rarely represent any other point of view. Because of our society's dogged belief that obesity is all about willful sloth and gluttony, communication about pregnancy in people of size has taken on an ominous moral overtone. The implication is that if the mother would only show a little self control, she could stop irresponsibly putting her baby at risk. Some imply that obesity during pregnancy is equivalent to child abuse. He wrote that “health professionals, pharmacists and community workers” should all take part in giving the advice to these groups of women, who include the obese, drug addicts, domestic violence victims, and women who suffer from depression. Lovely. So now fat people are looked at the same as drug addicts? A 2015 article trumpets that it's time to "make obesity the new pregnancy taboo." Well, we are certainly well on our way towards doing that. Look at the titles of a number of recent articles or books about obesity and pregnancy. These are not the titles of objective pieces. These articles don't just raise awareness about risks. These articles have an obvious overt agenda, and that is to strongly discourage fat women from having children at all. These articles are not meant to inform, but rather to scare, shame, and intimidate women of size. They're meant to promote a climate of hostility towards high BMI women among healthcare providers and society in general. It's meant to paint people of size as irresponsible and out of control. It's fat-shaming and scare-mongering, pure and simple. Often, these articles feature an apocryphal story of an obese woman with severe complications as a cautionary tale. This is often a woman of color, accelerating the stigma even further. These stories imply that fat women are all at equal risk for such a dire outcome, and that anyone who dares to be Pregnant While Fat is the ultimate Bad Mother. Or as one blogger puts it, "fat is the new crack" in bad-mother blaming. Anyone reading these articles might well conclude that virtually no fat woman has EVER had a healthy pregnancy or a healthy baby, that the ONLY way to have a healthy pregnancy is to lose vast quantities of weight first, and that the vast majority of fat women experience MAJOR complications and bear only deformed or doomed babies. And that simply doesn't jibe with the experiences of most fat mothers. 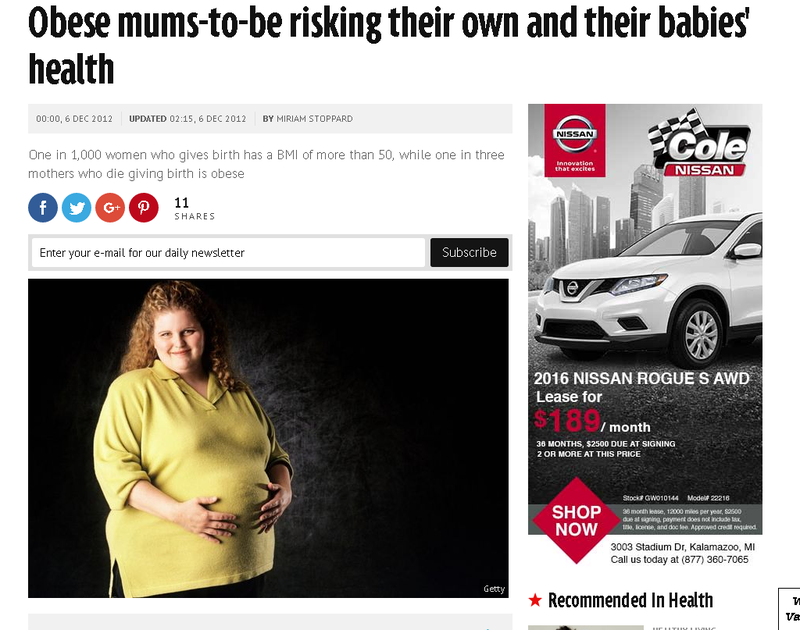 One of the main ways the media and some doctors discourage childbearing in fat women is by using exaggerated scare tactics. 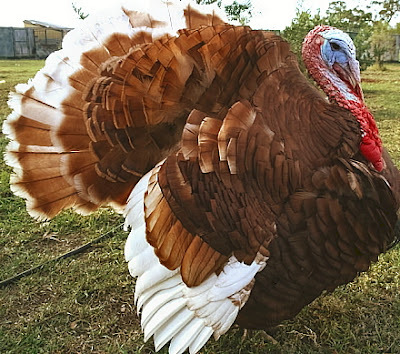 We've talked about scare tactic hyperbole before in our 2nd Annual Turkey Awards on Scaremongering and Shaming Tactics. But of course, this tactic is still alive and kicking, as demonstrated in the above articles. This is where "experts" get to pretend that they only have the best interests of women and children at heart when they publish inflammatory articles like these. It's not weight bias, oh no! After all, pregnancy while obese has risks, right? The 2017 article article above claims it's not stigma, it's just their concern for you. In other words, it's the medical version of Health Concern Trolling. Don't call it fat shaming ─ there are good reasons obese women shouldn't get pregnant. Some will say that this is ‘fat shaming’, but it’s just what we do in the medical profession; the identification of risk and its amelioration. We can’t sacrifice the health of mothers and babies on the altar of political correctness. The article then goes on to recite in scary language how obese women have higher risks for various poor outcomes, without giving any context to those risks, and without acknowledging that only fat people are targeted in this way. Yes, women of size have increased risks of some outcomes, such as gestational diabetes, blood pressure issues, certain birth defects, and stillbirth. It serves no one to pretend otherwise, and I believe firmly that women of size should understand the potential risks. I write about these potential risks so that women of size can come from an educated and empowered point of view, and decide for themselves what to do about them. However, it is important to have context to any discussion of risk. For example, a recent 2015 article is a meta-analysis of the risks of obesity and pregnancy. Again, as so many of these scare tactic articles do, it distorts risks by using relative risk ratios without any actual numerical risks. This makes the risks sound far more grave and life-threatening than they are. For example, past research has suggested that obese women have an increased risk for certain birth defects such as Neural Tube Defects (NTDs). Scare-mongering articles always highlight the birth defects risk in particular in media campaigns because it holds so much emotional resonance. Fat women are giving birth to deformed babies! If they weren't so selfish, these birth defects could be prevented! It's true that obese women have an increased risk for NTDs; some studies have found 2-4 times the risk for Neural Tube Defects (NTDs) in obese and very obese women. Sounds scary, doesn't it? Yet rarely do the articles mention that double or even quadruple a very small risk (about 1-2 per thousand) is still a very small risk. Do the math. Even if there is an increased risk, less than 1% of obese women will probably have a baby with a NTD. Gestational diabetes (GD) is another risk that is frequently mentioned in these articles. The risk for GD is about 3-5% among the general population, but it increases to around 15% or so in high BMI women. This is definitely a substantial increase and a potential cause for concern because it may lead to other complications. However, reverse the statistics and you realize that about 85% of high BMI women do NOT get gestational diabetes. The risk is definitely increased but it is hardly overwhelming. Do you come away from articles on obesity and pregnancy with the impression that more than three-fourths of very fat women will NOT be diagnosed with gestational diabetes? Nor do most articles point out that even if someone develops GD, it is a very manageable condition. Most people with GD are able to control it and have healthy babies. Yes, women of size are at increased risk for some complications, but being at increased risk does not mean that complications will happen. Many women of size have healthy pregnancies and healthy babies, a fact conveniently ignored by these media articles. They only feature stories of scary complications in order to frighten people of size out of considering pregnancy. You don't scare people away from pregnancy with stories of normal pregnancies and good outcomes. Nor should facing potential risk disqualify you from motherhood. All kinds of women are at increased risk for complications due to various factors (age, family history, racial or ethnic status, various health conditions) but are rarely told that they have "no business being pregnant." Their risk status is acknowledged and counseling toward risk mitigation is given. The same can be done for women of size. In dealing with women with risk factors, the focus should be on helping them have the healthiest pregnancy possible, while acknowledging possible complications ─ not trying to keep them from ever having a baby. It's deeming people with some types of risk factors (like type 1 diabetes) as worthy of having babies despite the risks, and people with other types of risk factors (obesity) as unworthy of having babies. This suggests a bias and stigma, a real implication of a eugenics agenda, even if it is an unconscious one. Many caregivers recognize that plenty of people of size will have perfectly fine pregnancies and healthy babies despite their size. They also know that in those who do experience complications, the emphasis should be on kind and empathetic care in helping that person towards the best possible outcome, not on scolding and judgment. Even complicated pregnancies can often have good outcomes with supportive care. It is NOT an irresponsible act to have a baby at a larger size. Yet many of these alarmist articles imply that it is. It's NOT up to doctors to decide which patients with which risk factors should procreate. Rather, it is up to the couple to look at their particular risks and make an informed decision about having children or not. Reasonable risk counseling is appropriate, medical bullying through risk hyperbole is not. It's not that we cannot discuss possible risks. Of course we can; that's an important part of the healthcare conversation. However, public health discussions about weight have gone from discussing possible risks, to making sweeping generalizations and exaggerations of risk in the public's mind, to scapegoating, scaremongering, and suspension of basic rights by healthcare professionals. What these experts fail to realize is that weight stigma in public health campaigns often backfires and leads to worse outcomes, not better ones. Stigma affects health negatively. Increasing stigma for people of size does not improve outcomes. When media coverage quotes "experts" who criticize women of size in inflammatory language for even considering pregnancy at a larger size, when it refuses to acknowledge that many women of size DO have healthy pregnancies and babies at higher weights, when it distorts risk, when it makes sweeping behavioral generalizations, and when it attempts to keep plus-size people from procreation through guilt and dire predictions, that IS indeed fat shaming. It is imperative that women should be discouraged from trying to get pregnant until they have attended to any excess weight. These doctors just don't get it. Being fat and wanting children poses a difficult set of choices, and that it's not always as simple as "eat better and exercise and you'll magically lose weight and be healthy enough for a pregnancy." Getting to so-called "ideal" weight is simply not a realistic goal for most fat people before pregnancy. Even when eating well and exercising regularly, many people of size stay fat. Even the fall-back stance of "lose just 5-10% of your weight" can have negative outcomes in real life too, as it often triggers a rebound to a weight greater than the starting point. Doctors want simple answers, but there are none. The fact is that nearly all fat people have tried repeatedly to lose weight, and rarely is it lost permanently. Frankly, if there really were an easy, foolproof way to lose weight permanently, we'd all be skinny. It's NOT just a matter of willpower, and research shows that long-term weight loss is very unlikely. Most fat people have lost weight time after time, only to see it come back over time. Many of us end up fatter after a weight loss attempt than before we began it. In fact, for many of us, yo-yo dieting is what actually put us in the "morbidly obese" category in the first place. For others, strong genetic and hormonal factors may be at work, making reaching that "ideal" weight statistically extremely unlikely. When faced with people like this, doctors often suggest bariatric surgery. Weight loss surgery does reduce BMI, but research shows significant trade-offs. There are reduced risks for gestational diabetes and large babies, but also increased risks of prematurity, too-small babies, and possibly neonatal mortality. Nutrient deficits are common and there is an increased risk for intestinal hernias; pregnancies after bariatric surgery must be monitored closely. There are no easy answers here. Many people stop weight loss attempts because they recognize that all the yoyo-ing is hurting their health far more than it is helping it. When they do this, they are not "giving up" or "letting themselves go" but instead focusing on healthy habits instead of weight loss as a measure of health. These habits often do not lead to significant weight loss, but people are still healthier by simply emphasizing good habits and weight stability. This approach is called "Health At Every Size" (HAES). For some, the decision to have a pregnancy at a larger size is one chosen once we recognize that long-term weight loss is not likely to happen and if we wait to reach that "ideal" weight range, we may never have a baby. Don't think that experts don't realize that. They do. Either they are deliberately deluding themselves about the long-term success of weight loss, or they are subtly trying to take fat people out of the reproductive pool. Another factor to consider is that dieting before pregnancy may deplete the body's stores of vital nutrients (particularly iron), just at the time they are needed most. Many "morbidly obese" people have significant micronutrient deficiencies already; repeated dieting may be part of that. Some consciously choose not to restrict intake or undergo malabsorptive surgeries before deciding to have a baby because of this concern. We do this out of love, not out of selfishness. Some people of size do choose to try and lose some weight before pregnancy; not necessarily down to "ideal weight" but at least a little bit in hopes of lowering risks. Everyone is an adult and gets to make their own choices. There is some research that it might improve some outcomes modestly. But is that the effect of actual weight loss or an effect of a change in habits? On the other hand, weight loss before pregnancy can also backfire, even modest amounts. Many of these women find that once pregnant, the body rebounds with a vengeance, gaining far more weight than "should" be gained in pregnancy as the body tries to store fat for the starvation period it thinks it is in. And gaining a great deal of weight in pregnancy is not ideal for anyone, mother or baby. There is also some research that suggests that dieting behaviors or weight loss product use just before or around the time of conception increases the risk for birth defects. So while losing even "just a few pounds" before pregnancy may seem prudent, it could have unforeseen consequences too. The bottom line is that there are no simple solutions. The best thing a person of size can do is to focus on improving health habits before pregnancy. This doesn't have to center on weight loss. For example, regular exercise is one of the most powerful things people of all sizes can do to improve their health before pregnancy. Checking that you have normal blood sugar and blood pressure before conceiving is a very important way to improve outcomes. Starting a prenatal vitamin and extra folic acid before conception is also a good idea. Emphasizing good nutrition can also be helpful, regardless of whether it results in weight loss. Some people of size choose not to wait till we are "ideal weight" before having kids because we know that there are risks to getting older too. Age decreases fertility and increases some pregnancy risks. We may decide that it's better to act sooner than later. Some of us believe that having a child at our present weight makes more sense than putting off pregnancy for years in an effort to lose weight. It's better than gambling on losing weight and then trying to keep the resultant pregnancy weight gain to "acceptable" levels, or to start out a pregnancy nutritionally-compromised from recent weight loss attempts or bariatric surgery. Having a child at a higher weight does not mean we are ignorant about nutrition and exercise, that we are recklessly exposing children to potential risk because we are too lazy or stupid to "eat right." Many of us have very normal eating habits and do not fit the stereotypes of junk food, overconsumption, and gluttony. Ultimately, the final choice about whether or not to lose weight before pregnancy is up to each individual. Some may decide to, and that's their choice. However, choosing not to lose weight first doesn't mean we are ignorant, uncaring, or unhealthy. Instead, for many of us, it may represent what we think is our best chance for a healthy pregnancy and baby. This is not an act of selfishness but an act of love, hard as that may be for some critics to understand. Researchers need to STOP trying to scare and shame fat women out of reproducing and pretending that they only have the noblest of intentions at heart. They need to STOP implying that fat women are irresponsible for considering reproducing, or that the only safe way for a fat woman to have a baby is if she loses weight first. The fact is that many fat women have healthy pregnancies and babies without losing weight. Experts need to study those women and see what can be learned from them. These media articles don't just stigmatize fatness; they often reflect other societal stigmas. This is intersectional eugenics, where women of color who are also women of size or disabled in some way are being stigmatized even more. In the New York Times article above, the cautionary apocryphal story about obesity in pregnancy is a woman of color. Of course, it's an extreme story. The woman, in her 30s, was already diabetic with kidney issues when she became pregnant. She gained a lot of weight in pregnancy, had a stroke, and her baby was born prematurely. She is pictured mournfully sitting by her extremely small son, touching his tiny feet, in the Neonatal Intensive Care Unit (NICU), and looking regretful. Imagine what happens when people with multiple marginalized social identities present for pregnancy care. Stigma increases even more. And it's no mistake that people with multiple stigmas are used as the "bad examples" in media articles, especially in the U.S. It's an unconscious desire to increase the "othering" of people of size in the minds of the public. Weight stigma is widespread in healthcare and can lead to anxiety, stress, depression, low self-esteem and negative body image. It can be particularly harmful during pregnancy, when women are at an increased risk of developing mental health issues and their bodies are being scrutinized more than usual. And discussions about things like how extra weight can put the baby at risk can lead to intense feelings of guilt when not handled properly. According to the CDC, black mothers in the U.S. die at three to four times the rate of white mothers, one of the widest of all racial disparities in women's health...In a national study of five medical complications that are common causes of maternal death and injury, black women were two to three times more likely to die than white women who had the same condition. According to the NPR article, the difference in maternal mortality between blacks and whites is not attributable to education, socioeconomic status, or access to healthcare. African-American women with every advantage still have poorer outcomes in general. Much of this is due to the stress of long-term exposure to racism and stigma. What has been surprising recently is the discovery that black women are particularly vulnerable after the birth. More than half of maternal deaths occur postpartum, and people who experienced high blood pressure or cesareans are particularly vulnerable. Black women have higher rates of both blood pressure issues and cesareans. Add in chronic stress from racism and care models that chronically neglect women after birth and you have a recipe for poor outcomes. The intersection of race and weight leads to even more stigma. The NPR article related the story of a young black Florida mother-to-be whose breathing problems were blamed on obesity when in fact her lungs were filling with fluid and her heart was failing. Getting providers to listen and take your concerns seriously is difficult, especially if you are a person of color and size. That's why it's even more shameful when articles about the dangers of obesity and pregnancy feature women of color as their bad-mother examples; it multiplies stigma. As Abigail Saguy and Kjerstin Guys of UCLA note, articles that feature a cautionary example of a poor person of color "reinforces social stereotypes of fat people, ethnic minorities, and the poor as out of control and lazy...In the contemporary United States, body size intersects with other dimensions of inequality." Most researchers and care providers do not consciously wish to stigmatize women of color or women of size. They want to improve outcomes, which is a good goal. But some are tone deaf. They refuse to understand that the public health campaigns they are waging around obesity and pregnancy are far MORE stigmatizing and have begun to venture into the eugenics realm. The attempt to limit who can procreate doesn't just stop with scary media campaigns, hyperbole about risk, and pressure to get to a "normal" BMI first. Pressure for sterilization or termination (abortion) is another way that providers try to limit family size in high-BMI women. We should be clear that most providers don't do this. However, it is real and it has happened. And that is inexcusable. 'At 31 weeks pregnant the consultant sat me down and was blunt. Firstly he said the diabetes could cause the girls to grow quite large so I would need a C-section. And then he said another pregnancy would most likely kill me as even if I weren't pregnant, I was at a high risk of becoming a diabetic, ending up in a wheelchair and having a heart attack. As such doctors suggested I should not become pregnant again and I could be sterilised during the C-section. And indeed, that's what this mother chose to do. The doctor was sufficiently scary in his predictions that she permanently ended her childbearing. Sometimes the pressure is subtle, as in refusing to remove birth control devices. One Canadian woman recounted the story of her doctor who refused to remove her IUD because he felt it would be a "disaster" for her to become pregnant. Although this is not permanent irreversible sterilization, it is a de facto sterilization. Other fat women have been pressured to have their tubes tied when they have babies. Gina Marie's story from my website shared the tale of a woman who was pressured for sterilization during labor. This is an ethical violation; ethics guidelines state that women should never be pressured for sterilization when particularly vulnerable, such as during labor. But it happened to Gina Marie anyway. Her labor was induced early due to fear of a big baby, and not surprisingly, she ended up with a cesarean. The OB was very vocal about how she shouldn't be having children at her size, and pressured her to agree to have her tubes tied during the cesarean. When she would not agree to having her tubes tied, they tried to frighten her by exaggerating the risk of complications during the cesarean and asking her and her partner about her funeral plans during consent for the cesarean. Then they punished her by doing a classical cesarean (a giant incision, up and down, far more risky than a side-to-side incision), blaming it on her obesity, and telling her that her uterus would "explode" if she had any more pregnancies. She never did. In this case they did not succeed in directly sterilizing her but they did succeed in a de facto steriilization. Although most care providers will not go this far or be this coercive, there is subtle pressure towards sterilization for fat women. We know there is a long and shameful history of forced sterilizations or sterilizations without consent in the United States. This is just the latest version of that, dressed up as "concern" for your health. Eugenics policies were often directed at women of color, poor women, and "disabled" women because medical authorities thought they should not be reproducing. "I also was told I could not have kids. Then when I got pregnant I was told by various doctors for various reasons that I should abort." "[The doctor] even suggested that we consider having an abortion because the likelihood was great that [problems with the baby were] going to happen....We had 2 weeks to decide about the abortion because legally you have up to 24 weeks to abort the baby." "[The doctor said:] 'No fat woman can ever have a healthy pregnancy. Besides, if you did get pregnant, I'd order you to have an abortion. But that's a moot point anyway, because you're too fat to get pregnant.' "
Sometimes the pressure for abortion is not quite as direct. The potential for death for mother or baby is emphasized and the parents are left to fill in the dots as to what their next action should be. Sometimes providers imply that fat women will die if they try to carry a pregnancy to term, that having a baby is committing "suicide by pregnancy." They hope that the women will be too scared to continue the pregnancy or try to conceive in the first place. Or they imply that the baby is likely to be deformed or die. "I went to see a doctor today...He basically made me feel my baby is a death sentence...In his "honest opinion" I am going to die during labor/delivery or recovery." "I used to go to a really Fat phobic doctor; he was so awful he told me that I couldn't even consider the idea of having another baby or I would die for sure (due to my weight)." "[My doctor] was appalled when she heard I was not on any form of BCP [birth control pills] and said that "at your age and with your size" that either the baby or I would die." "According to him I'm probably going to die of a heart attack sometime during my pregnancy or shortly after." A reproductive endocrinologist refused to help a high BMI woman get pregnant, saying it would be unethical to do so. He says if she did somehow manage to get pregnant, "The baby would only have a 5% chance of survival." One of the very first stories I heard years ago when I started my website was the woman who was told that she would "die on the table" while giving birth. Others have been told that they would surely have a heart attack during pregnancy or shortly after, or that they were "85% likely to die on the table" during the birth. Although these doctors didn't directly pressure the women to have an abortion, statements implying that death is practically inevitable for a fat mother or baby are certainly going to be interpreted as pressure to terminate a pregnancy. Here is a story of a woman in the U.K. who was so frightened by the "obesity risk" talk" from her care providers that she was strongly considering termination of the pregnancy. Please please please, can someone help me. I am 10 weeks pregnant and currently have a BMI of 35...I have had my first midwife appointment today and was told that more than 50 percent of maternal deaths in pregnancy and childbirth are obese mothers and that I will have to have special monitoring and won't be allowed to have a natural birth at the birth centre and will have to be under consultant care and be constantly monitored throughout labour (meaning no water birth, no moving around, no getting into positive positions to birth). I am so scared and disappointed, I feel like I am an unfit mother already and feel that the drs think I do not care about the health of my unborn baby. Now I know that this will not go down well with some people but I am considering a termination so that I can lose more weight before carrying a child (I have currently lost 70 pounds). Here is another similar story. The woman was so scared by all the death talk around obesity and pregnancy that she was considering ending her pregnancy, even though she'd already had one successful pregnancy and healthy baby. She was particularly afraid of the risk for a blood clot (DVT). I am pg with my 2nd child. With my first I was overweight with a BMI of 37 but had a textbook perfect pregnancy with low blood pressure, blood sugar etc and a small baby, natural birth no issues etc and everything was hunky dory. Fast forward 2 years and I have since suffered anxiety and depression, mostly directed towards my health. I have become a hypochondriac which is mental torture some days. 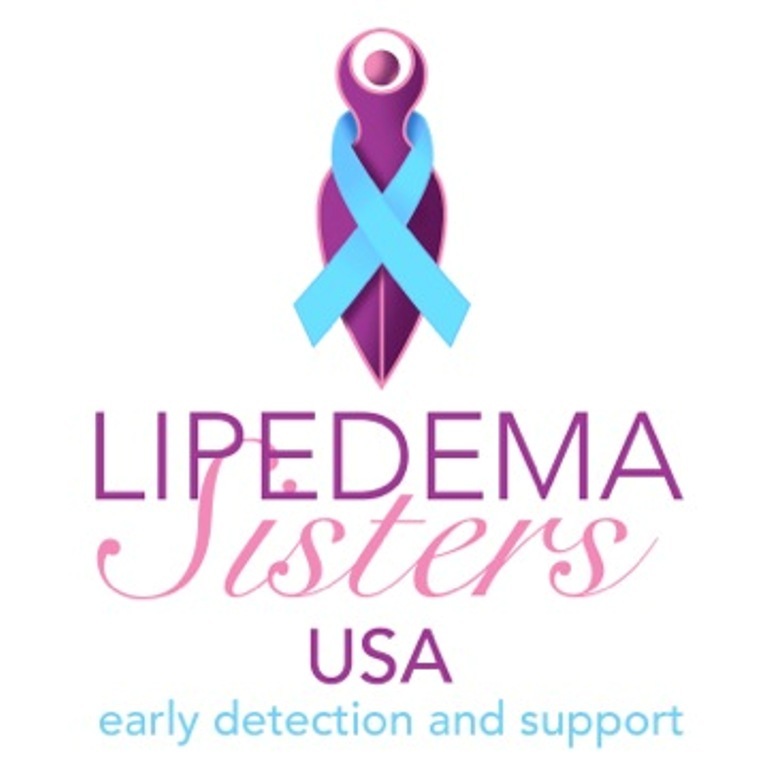 I have gained a weight since I had my dd...I am so upset and disgusted with myself , I have beat myself up all day about this. I have done a lot of research the past few days and there's a lot of scary articles about how maternal death and infant death is linked to obesity, how overweight women have a much bigger chance of dying during pregnancy etc, developing DVTs (which is one of my massive hypochondriac fears). I am terrified I am going to die during this pregnancy because of my weight that I am considering not going ahead with the pregnancy. I am losing sleep and every ache or pain I am worrying about a DVT. It has been mental torture so far and another 8 months of this seems unbearable. Again, this speaks to the importance of presenting risk realistically. It's true that obesity is a risk factor for DVT, but the actual chances of having a blood clot are pretty small, even in a "morbidly obese" pregnant woman. Many women of similar size (including me) have had pregnancies without blood clots, but these are not the stories being promoted by the media or shared by the doctors. Furthermore, if she is really worried about a clot, she could speak to her provider about taking a low-dose aspirin prophylactically. Some providers do this regularly with obese women; while no research on its benefit for obese women has been done, it is a choice that can be considered if she is really worried or has a strong family history of clots. She also needs treatment for her anxiety so she can deal with her fears. Doctors may not intend to be actively promoting eugenics but they cannot overlook what the real-world effects are of discriminatory scare tactics. And shamefully, some are fully aware of these effects and employ them deliberately. How many women of size have had their family size limited, directly or indirectly, through medical bullying? How many people of size have decided not to have children because of the over-the-top public health campaigns against obesity and pregnancy? How many have put off pregnancy until they get to a "normal" BMI, only to find that day never comes? How many have faced pressure for sterilization or de facto sterilization? How many have considered ending their pregnancies because their doctors told them they might die? How many have been pressured to abort a wanted pregnancy because of their size? There is more than a whiff of eugenics in these latest media campaigns, whether providers mean it to be that way or not. Some researchers have suggested that such stories "hint at so-called soft eugenic practices to keep obese women from reproducing." 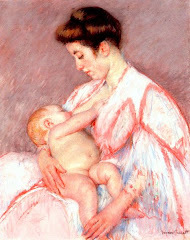 Doctors have legitimate reasons to warn women of the complications related to excess maternal weight, they acknowledge. However, much of the obesity “risk talk” is sensationalized, moralizing and shouldn’t position heavy women as “always-already diseased and dangerous to their child,” they write in the latest issue of Social Science & Medicine. Larger women, they argue, can have perfectly healthy, incident-free pregnancies and births. “We’re certainly not trying to say that any of the healthcare providers that are referred to in the study is actually a eugenicist,” co-first-author, Andrea Bombak, an assistant professor at Central Michigan University said in an interview. Many women had positive experiences. But many others also described being made to feel as if they were “disgusting” or unfit to be mothers. Bravo to these researchers for calling out the hyperbole and stigma in these media articles and public health campaigns. It's time for others to take up their call. When obese women are counseled about pregnancy risks with scare tactics and judgment, when newspaper articles use hyperbole to scare high-BMI women away from pregnancy, when obesity in pregnancy is viewed as child abuse or treated as the equivalent of drug addiction, and when women are pressured towards sterilization or termination because of their size ─ then it cannot be denied that these things begin to cross over into the repulsive realm of eugenics. Sadly, some medical professionals would like to prevent ALL fat women from having babies if they could. Remember the media article that states starkly that "Obese women should not have children"? This comes directly from a public health campaign started in the U.K. and endorsed by leading "experts." Most of the time these days it's considered wrong to question a woman's basic right to motherhood, even in a mother at risk for complications. Yet reproductive policing and shaming does not seem to be equally applied among groups considered at risk for complications. It seems to be focused mostly on obese people, and worse yet, this practice is widely defended in medical circles. The kicker of all these consequences is that obesity begets obesity. "Maternal obesity is the most significant factor leading to obesity in offspring and, coupled with excess weight gain in pregnancy, also results in long-term obesity for women," the reviewers write. Although doctors tell themselves they are just looking out for their patients, the underlying agenda here is about ridding the world of fat people. What better way than to prevent as many fat pregnancies as you can? Because medical providers have have been taught that obesity only occurs because of sloth and gluttony, many care providers see fat people unworthy of procreating. They use whatever means they can to discourage fat women from having a family. This far exceeds their mandate as physicians, and worse, it smacks of eugenics. Sorry, but NO ONE has the right to forbid reproduction. The government, medical authorities ─ history has shown time and again that these people should NOT be the gatekeepers of reproduction. Whether to have a baby is a decision for the woman and her partner to make and no one else. Yes, women of size have higher risks in pregnancy as a group. So do many other groups. Fat people should not be singled out. People of size should be counseled (with compassion, not scare tactics) about their risk status and possible complications, and they should given information about how to mitigate or manage those risks. Whether or not they experience complications, they should be always be treated with dignity, respect, and support. The ability to reproduce is one of the basic rights of people in society; the state and/or medical caregivers have NO business trying to govern that. People should never be subject to shaming or scolding for the simple act of wanting to have a family. That principle applies just as much to people of size as to those in any other group. Thankfully, many care providers are supportive of women of size, but the fact that some resort to extreme tactics to prevent or discourage people of size from reproducing is a terrible stain on the medical profession. This is a unique and insidious form of obesity eugenics and IT MUST STOP. Wow, what an incredible article. I wish you could write in the big media instead of those fat-shamers.